Being a medium-sized family friendly dog, Tibetan Terriers often carry names like Bella, Jake, or Rudy that are high in popularity. A good way to come up with some potential names is to consider characters from books, movies, and television. Find a role that matches up with some of the traits of your puppy and go from there. Known for their very shaggy coat, many Tibetan Terriers have names like Shaggy or Chewbacca. Sometimes referred to as 'the Holy dog of Tibet', the breed was often kept by Tibetan monks and was thought to bring good luck. Tibetan names like Kalsang (meaning good fortune) and Norbu (meaning jewel) provide many unique options that are great conversation starters. Other possibilities include luck related names like Fortune, Charm, or Ace. Some of our pages will contain a subcategory. A subcategory is a slightly more specific grouping than the main topic of the page. For a subcategory, we will include a separated table of names and corresponding descriptions. An example of a subcategory of Red Dog Names would be 'Dog Names Inspired by Red Wines'. 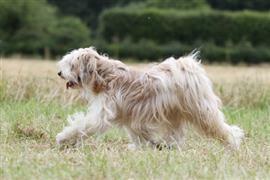 If you have any subcategory ideas for the Tibetan Terrier Names page, we would love to hear them. Use the form below to submit your ideas.